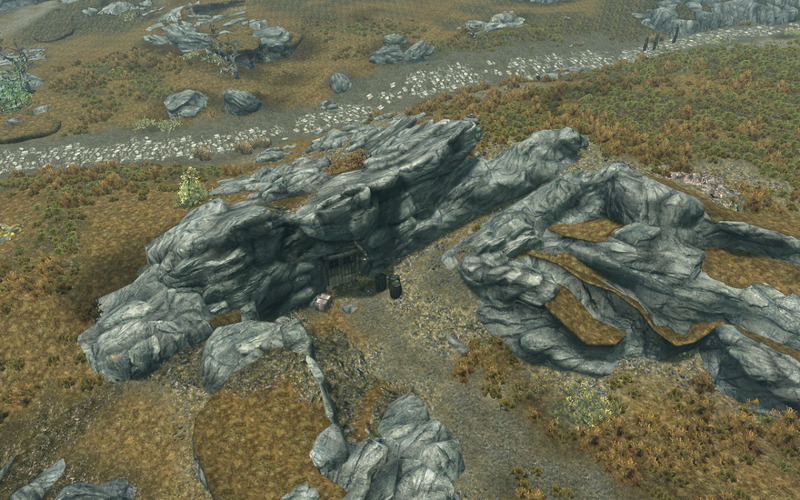 Skryim begs to have pictures captured from it. While it may lack some other sophisticated details that the best rendered games have in its image quality, it more than makes up for this small loss of photographic detail with a tremendous helping of masterfully handled artistic direction. I don't think there are any other games out there that look this good. In the fewhours I have been playing it, I have taken literally dozens of screenshots—and that's from restraining myself! You can click on the images below to see a full-size version but beware: these images are huge! Feel free to copy them and use them as wallpaper and whatnot. *Note: While the below information refers to only the PC version, RVP has supplied instructions for capturing screenshots on a PS3 in the comments below. Thanks to RVP for the contribution! 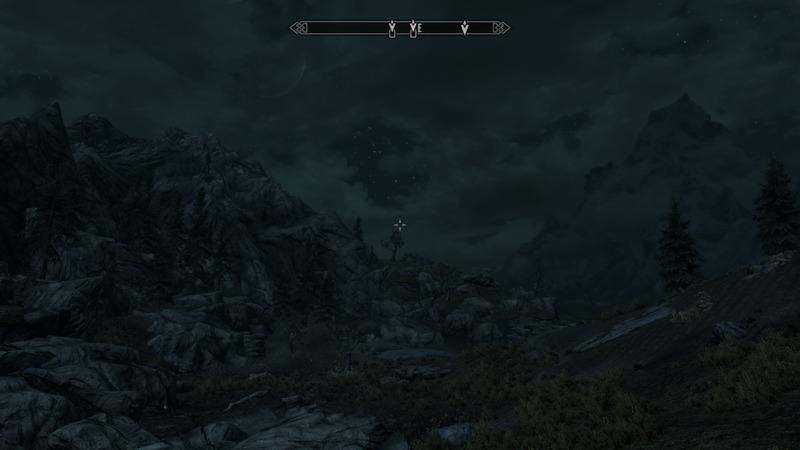 Playing Skyrim is like walking around inside a painting by a great artist. Press the printscreen button (PrtScr) which is located in the top right area of standard North American keyboards. When you take the screenshot, you'll notice a short, one second pause in the game. This will save your screenshot in the game directory. 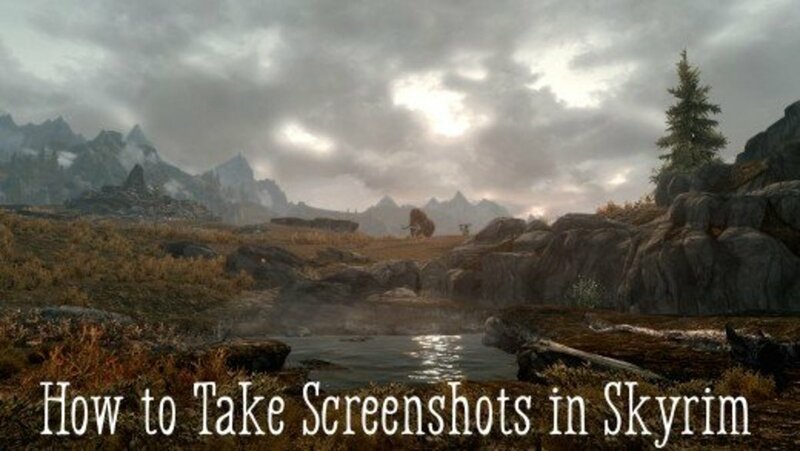 If it doesn't seem to be taking any screenshots, try checking Users/(username)/My Documents/My Games/Skyrim skyrim.ini file to make sure the bAllowscreenshot function is set to 1 instead of 0. Just as breathtaking at night. 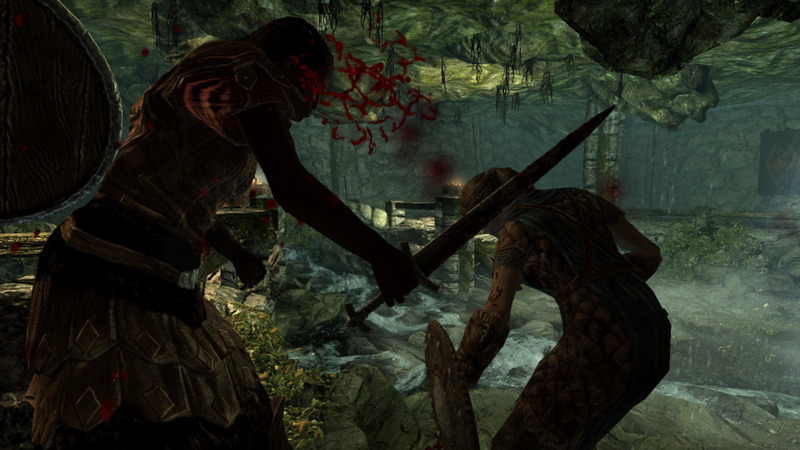 These screenshots show both with and without the HUD. One of hundreds of interesting locations to take a screenshot. Steam will then inform you with a small pop-up and sound. You will then be prompted to manage your sceenshots when you exit the game. You can share your sceenshots with other people in your Steam community. Note: You can check out the help page if you're having problems with your Steam community overlay. 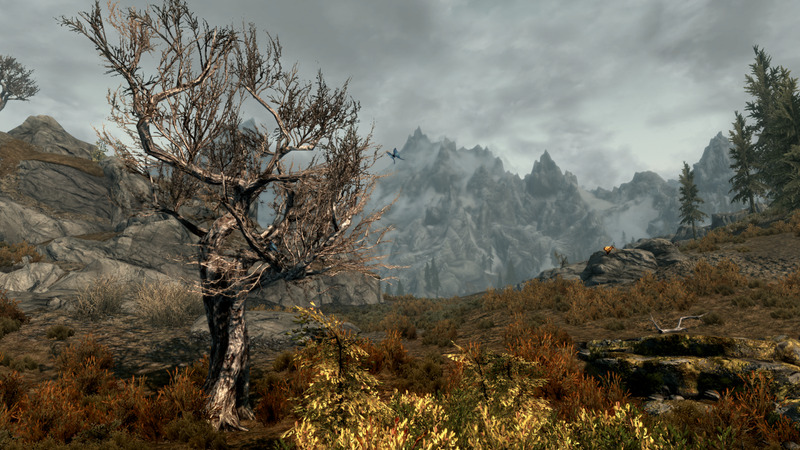 Skryim has a living, dynamic landscape, perfect for a quick vacation from real life. If you don't want the heads-up display that shows the compass, text, and stats (HUD) to show up in your screenshots, you can temporarily remove them by: Opening Settings -> Display -> and dragging the HUD Opacity to the far left or by using the console. To open the console, type '~', the tilde key, which is located in the top left corner of standard North American keyboards. With the console open, type tm (which stands for toggle menu) and press Return. While the console is open, your game will be paused; when the console is closed, your game will continue, but the HUD (and menus) will no longer be visible on-screen. Open the console again by typing ~, then type tm again, and then close the console by typing ~ again. Note: Although using tm might seem a little more complicated than changing the display settings, I find it to be faster if I just want a quick screenshot. Meet the pointy end of my stick, traitor! You can toggle the free cam on and off using the console to take action shots. You can get around this by opening the console and typing tfc 1 then close the console by pressing the '~' again. tfc stands for 'toggle free cam' and allows you to detach the camera from its usual position and move it around a scene using the movement keys (WASD). While the free cam is active, the action will stop and you can spend as much time as you like lining up the perfect shot. When you have the shot lined up, just use the normal methods of taking a screenshot. When you're done with your shot, open the console again and type tfc 0 to return the camera to its normal position. Note: You can combine the free cam with the no HUD option and take action shots without any HUD elements as well. Just type 'tm' after 'tfc 1'. The console will disappear, so remember to type '~' again after typing these commands to get back to the game so you can take your screenshots. 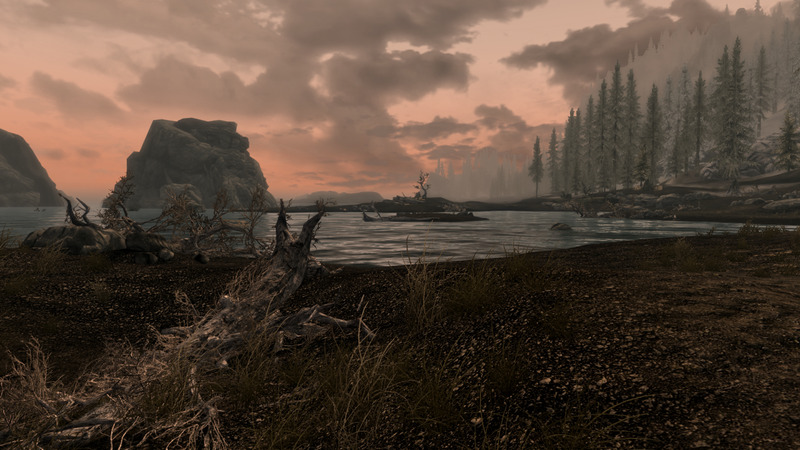 Sunset on the far Northern coast of Skryim. Below is also a good tutorial about setting up a Dazzle. 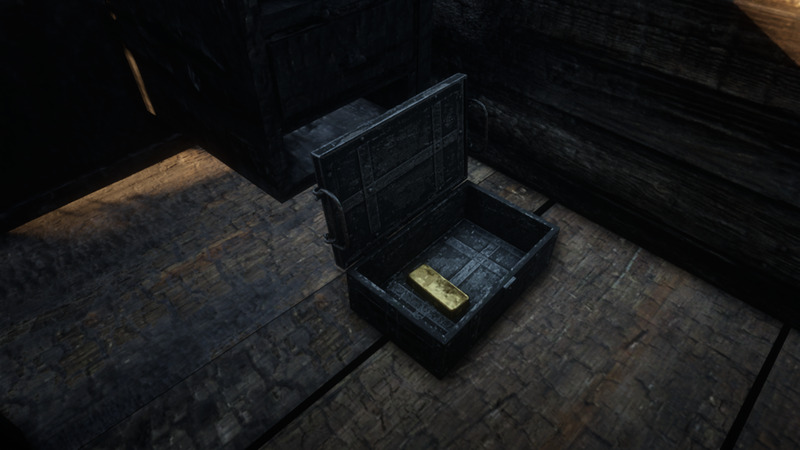 Treasure Map IV - Great Skyrim Treasure Hunt - "Elder Scrolls V: Skyrim"
How to take a screenshot when playing in window mode? Seems like it does not work. I have this one. iScreenShotIndex=2 Should I put 1 instead of 2? Leave it and add the good one? Or delete and replace with the good one? I have tried many times to take screen shots with Print Screen. When I tried to view these pictures all I get is an unable to view message. Using F12 does not work for me on my laptop so I changed that button to my HOME key and I still cant do Steam screenshots. I was wondering how to do this. Thanks for the article. The pause after pressing the prt sc button is coming but I am unable to locate the screenshots in my C:\Program Files (x86)\ skyrim folder. Pls help. Hi geowix999. That's odd. What's your operating system? Is it giving you any warnings? Bitmap files are a pretty standard format. You should be able to open them in any image editing application. I use Gimp. It's free. Just Google it. You can use it to convert .bmps to .jpegs, too. Incidentally, tfc will detach the camera, typing tfc again will reattach it. If you add the 1 it will detach the camera and pause the game, to unpause the game you can type tfc 1 again. how can you get the HUD away? So, i need Steam to do screenshots? 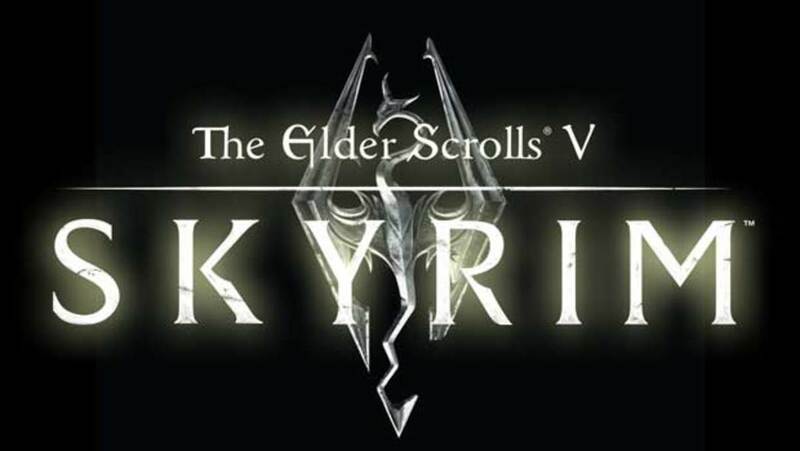 edit the skyrim.ini file, under the [display] section add a line bAllowscreenshot=1 or ensure that is set to 1 already.. use the printscreen key.. enjoy! what file do you open. Ive taken loads of photos and i can't find them. @Grovstock: If you're using a PC version, you do not need a program. 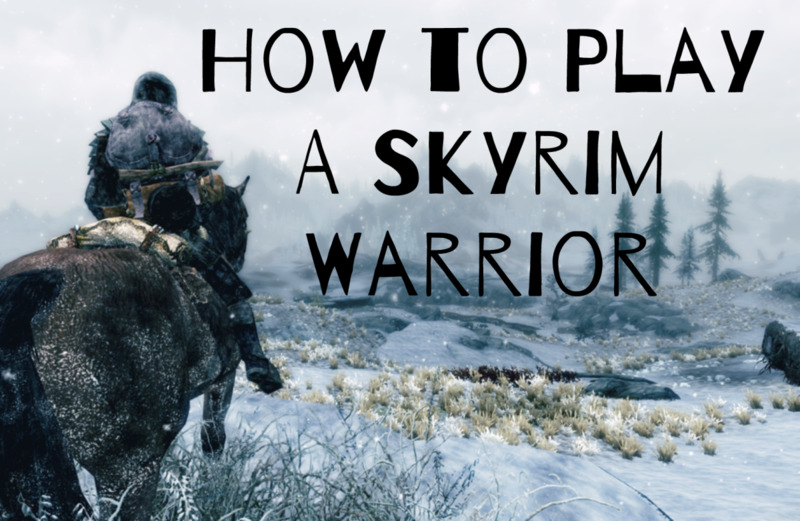 I'm pretty sure you need Steam to activate & run Skyrim (I have the boxed version and it runs through Steam), so you can either hit PrtSc to send the image to your Skyrim folder or F12 to send it to your Steam image gallery. The details are in the article if you get confused. 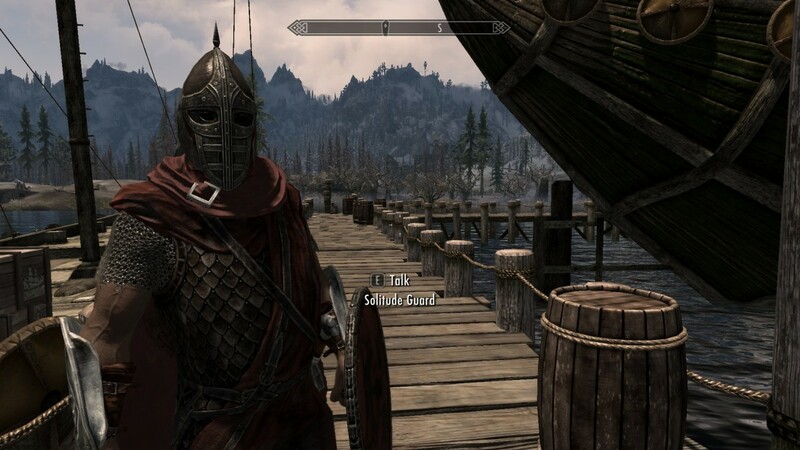 there is another way to take screenshots on the ps3. I don't know how yet, but I went through my photos in my xmb and there was a random screenshot of the back of my character and some mountians. @ranjit: I was watching LOTR the other day and was surprised by how similar the environments were. I hadn't seen the movies in a long time. It's obvious they were heavily inspired by the movies. you feel like you are in the " lord of the rings "
@Misiek: Ah. Good to know. Thanks for the update. Of course RVP didn't mentioned that this ICO has resolution like 160x120? You call "that" a screenshot?!? @nicholei28: You should be able to view them fine in Windows. It's a native format and should be common to all Windows applications. I edit images in Paint all the time. You can always save them in Steam (F12) which stores them as jpg if it's really not working. Or you can dl Gimp or Irfanview or another free image editor. How do you pronounce "^^^^^^^"? @RVP: Thanks for the information regarding PS3. I'll make a note of it at the top of the article. Ahhhh, here we go--For PS3--First, save your game looking at what you want to take a screenshot of. Then, copy your file onto a USB stick and open ICON0.PNG on your computer. 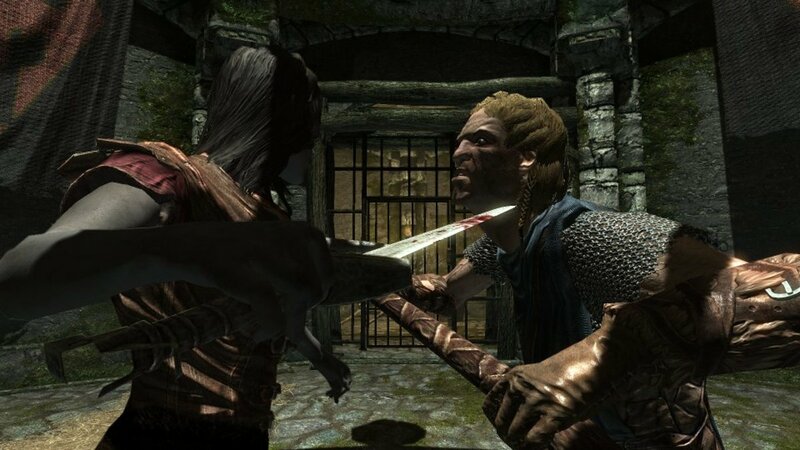 @mobias: I take screenshots almost every time I play. It really is a beautiful game. Ooooh I really love that last pic. I cannot wait to play this game, I'm sure I will have a whole mess of screenshots as well, throughout all my adventures! @djskagnetti: Thanks for the additional info. 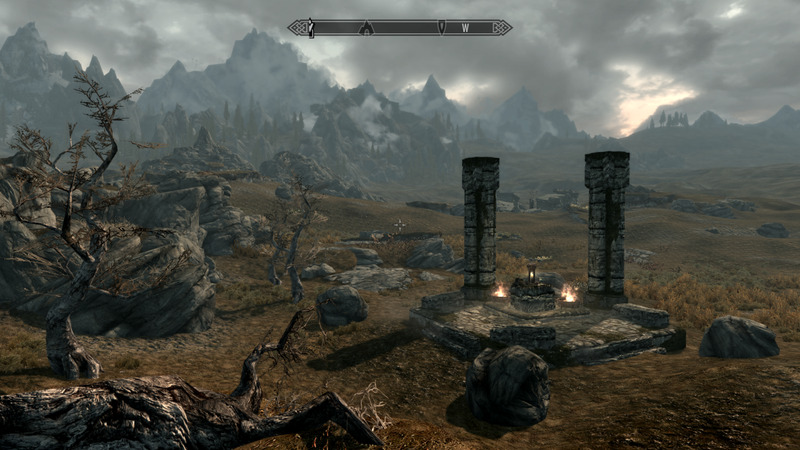 Even though Skyrim's HUD is very small, removing it can make the images look a little better. @Nurfninja: Thanks! Not running it on anything terribly fancy: Acer, AMD Phenom II X4 840T quadcore, AMD Radeon HD 6570 1GB graphics card, 27" monitor. I only get High settings. @SimeyC: I agree! The music is great, too! It really sets the tone. And the writing and voice acting is a lot better than it used to be. 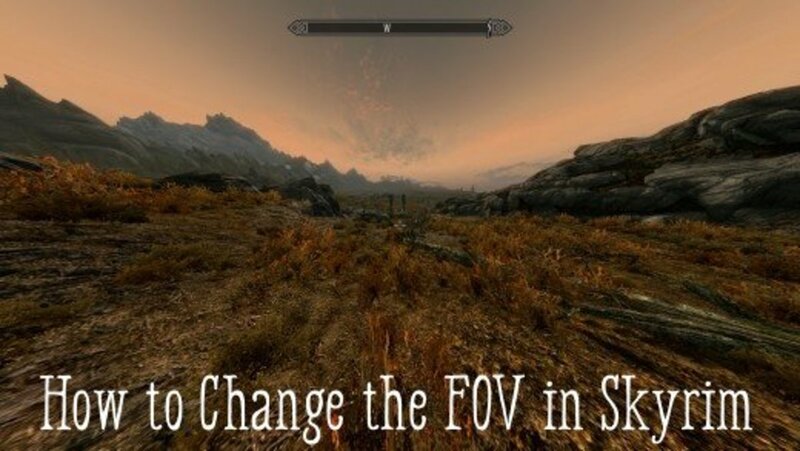 Thanks for the tip for no hud pic taking. First hit on google :D.
Great game so far; superb music, brilliant graphics, great plot....well worth the money spent! Excellent post! Two thumbs way up, what pretty pictures they are! If only I had the PC version. Looks awesome! what pc do you run this on?